In this learning activity, the student will learn how, even in the worst of events, you can take "three big lessons" from Frederick Douglass and have a better chance to be successful in life. To study the life and career of Frederick is one of the most uplifting learning experiences. Frederick Douglass had great respect from several Presidents, and was most instrumental in getting the black American men into the Civil War as full-fledged soldiers. The Emancipation Proclamation was also a result of counseling by Douglass to President Lincoln. The student will research Frederick Douglass' life, and then apply these concepts to some personal activities. He would devise plans of escape, at a very young age. He would finally escape still at a young age. Frederick was taught to read and write by a white person when young, and he took full advantage of these skills the rest of his life. As we will consider in this multi-faceted learning activity the "Three Learnings," he would speak on, these can be used in the study of Frederick Douglass and the events of his life. Abraham Lincoln was born in the wilderness of Kentucky into the family of a sustenance farmer in a primitive environment. While growing up in Kentucky, the young Abraham Lincoln would quickly grow to appreciate and hate the institution of slavery. When studying the life of Lincoln, one often considers the life attributes of honesty and the life-long desire to learn, starting by the light of the fire." In this learning activity the two famous men and acquaintances' will be compared and contrasted. President Lincoln believed strongly in ridding the country of slavery, but also believed in strictly following the Constitution which was allowing the institution. He realized that the only way to rid the nation of it was with a Constitutional amendment. That was the "slow" way for abolishment to occur. Frederick Douglass and the other abolitionists were in a much faster mode, and at first they would be frustrated with the slowness of the new President in 1861. Things would not move on any emancipation of slaves until 1862, when a victory, of sorts, occurred at Antietam, and then the Emancipation Proclamation would be signed into effect. After that African-American free men would be allowed to sign up to fight for the Union army. This is when Frederick Douglass would help the President find ways to make things better for the new African American Union units. Douglass would even work hard at recruiting his own people, including his own two sons, Charles and Lewis. The 54th Massachusetts African-American unit led by Col. Robert Gould Shaw would set the standard and prove the bravery and ability of African American soldiers. In this activity, the early life (pre-1860), the later life (post 1865) will be covered in later learning tasks. The primary Douglass life considerations will be the period of time from 1860-1865. This activity could be covered chronologically in-order, if time will allow such a study. Frederick Douglass' role was major in helping the Northern Army to win Civil War. His goal of gaining freedom for slaves was met, and he would continue in post war years to bring about equality. --THIS ACTIVITY WILL CONCENTRATE ON DOUGLASS' WORK DURING THE PERIOD OF 1860-1865. --A brief study of his early life will help for understanding of his three learnings for making one’s self successful. A similar brief study of Douglass’ post-Civil War career and life will show how he continued success until his death. · A series of READING ARTICLES (excerpts) especially selected and printable will be provided to complete each of the Tasks. These are posted separately and are available when clicking the hyperlink within the task directions. · Images are available from the Library of Congress and through Google image search or other search engine. · Tasks #1-2 As a Slave, Free Man, and Underground Railroad conductor- Frederick Douglass’s childhood and early life up until the Civil War including getting freedom, moving to Rochester N.Y., publishing and writing his North Star newspaper, working with other abolitionists, giving speeches, and helping as a conductor on the Underground Railroad in N.Y.
· Task #3 Lincoln’s First Inaugural Address, which did not please Frederick Douglass and other abolitionists in the country. · Task #9 Douglass’ three complaints to the President; resulting improvement of conditions for black soldiers in the War, and why this came about. When did Douglass first attempt to escape? When did he finally escape? Where did he go after this successful escape? Student Task #2-- CONDUCTOR FOR THE UNDERGROUND RAILROAD Working forward in time, your job now is to study and read about Frederick Douglass's years after freedom as a conductor for the Underground Railroad and newspaper writer and publisher. Use the Online narrative of this period of Douglass's life at the American Memories Collection at http://quod.lib.umich.edu/cgi/t/text/text-idx?c=moa;idno=ABT6496. · Read to find the names of the other ABOLITIONISTS that Douglass associated with. Where did these people live? Frederick Douglass "Abolitionist/Editor"A biography of the life of Frederick Douglass by Sandra Thomas at http://www.history.rochester.edu/class/douglass/home.html · Where did Douglass serve as an Underground Railroad conductor? Where did Douglass live and publish his first newspaper (North Star)? 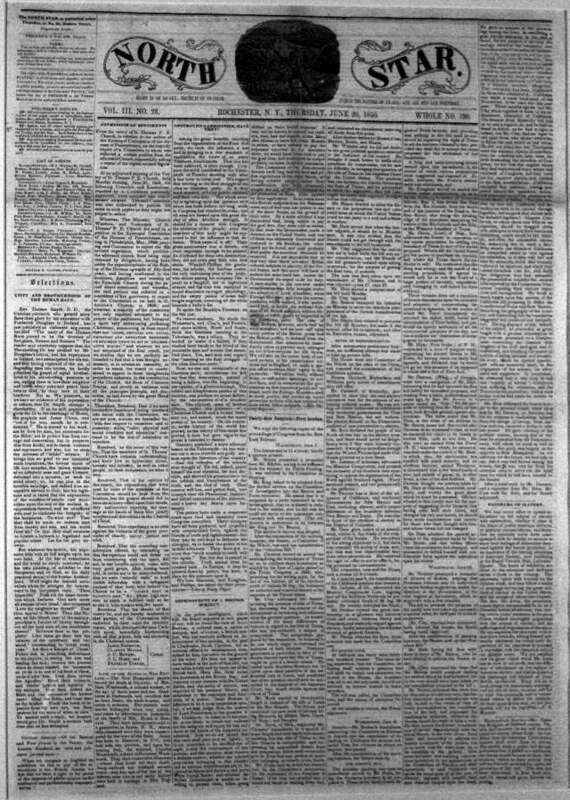 Why was the newspaper called North Star? · What famous ABOLITIONIST did Abraham Lincoln associate with that would lose his life in violence? Did Douglass condone this abolitionist's violent methods? Where did this Abolitionist lose his life? · What was the title of the song about John Brown, print it and illustrate it on a special poster. Visit the PBS site about John Brown at http://www.pbs.org/wgbh/amex/brown/sfeature/song.html Why do you think John Brown became an American Folk Hero? Didn't he break laws and cause violence? (Page One of the transcribed version from the Library of Congress--First Inaugural Address by Abraham Lincoln, 1861)--sentences numbered for convenience in matching to questions to follow: Use these actual speech sentences with the following questions. Passage One-- "Resolved, That the maintenance inviolate of the rights of the States, and especially the right of each State to order and control its own domestic institutions according to its own judgment exclusively, is essential to that balance of power on which the perfection and endurance of our political fabric depend; and we denounce the lawless invasion by armed force of the soil of any State or Territory, no matter under what pretext, as among the gravest of crimes." What does the statement mean that each State should order and control its own domestic institutions? Is slavery an institution? What other activity by a state is an institution? Passage Two-- "I now reiterate these sentiments: and in doing so, I only press upon the public attention the most conclusive evidence of which the case is susceptible, that the property, peace, and security, of no section are to be in anywise endangered by the now incoming Administration. I add too, that all the protection which, consistently with the Constitution and the laws, can be given, will be cheerfully given to all the States -- as cheerfully to one section as to another." What do you think President Lincoln considers property? Why did the President use the word cheerfully in upholding slavery in the Southern States? Do you think he made a mistake using this word in his speech? How do you think the abolitionists, including Frederick Douglass felt when he used the word cheerfully? Passage Three-- "There is much controversy about the delivering up of fugitives from service or labor. The clause I now read is as plainly written in the Constitution as any other of its provisions: " No person held to service or labor in one State, under the laws thereof, escaping into another, shall, in consequence of any law or regulation therein, be discharged from such service or labor, but shall be delivered up on claim of the party to whom such service or labor may be due." Passage Four-- "It is scarcely questioned that this provision was intended by those who made it, for the reclaiming of what we call fugitive slaves; and the intention of the law-giver is the law. All members of Congress swear their support to the whole Constitution -- to this provision as much as to any other. To the proposition, then, that slaves whose cases come within the terms of this clause," shall be delivered up," their oaths are unanimous. Now, if they would all beginmake the effort in good temper, could they not, with something like nearly equal unanimity, frame and pass, a law, through by means of which to keep good that unanimous oath?" Passage Five-- "There is some difference of opinion whether this clause should be enforced by national, or by state authority; but surely that difference is not a very material one. If the slave is to be surrendered, it can be of but little consequence to him, or to others, by which authority it is done. And should any one, in any case, be content that his oath shall go unkept, on a merely unsubstantial controversy as to how it shall be kept?" · Who is in charge of enforcing the Fugitive Slave Law: States or National Government? Try to read between the lines of this sentence and determine if President Lincoln seemed actually cheerful about the condition of blacks in the North, and even occasional free-men that were often captured and taken back to the South for slavery. Passage Six-- . "Again, in any law upon this subject, ought not all the safeguards of liberty known in human and civilized and humane jurisprudence to be introduced, so that a free man be not, in any case, surrendered as a slave?" · This last sentence clarifies what the President thinks about the capture of free-men in the North. Why did the President apply the safeguards of liberty in the human jurisprudence (of the United States) to the problem of captured free-men in the North? Abraham Lincoln was elected. He had made many speeches and comments that made abolitionists comfortable with his obvious "hatred of slavery." He was now elected as President, and in his first Presidential speech, he seems to soften toward slavery and any abolitionist viewpoint. We will start the Frederick Douglass learning experience with this speech and his response. An introduction to the two great men we are studying will need to be done first, and then the First Inaugural Speech itself will be studied. · Google search for Abraham Lincoln quotations concerning his feelings toward slavery. Make a collection (electronically & print) of at least five quotes you can find. · Design and print a Lincoln White House invitation with computer software such as Word, Publisher or other publishing software. Make up a list of very important dignitaries that would have received the invitation to attend President Lincoln's second inauguration reception. Research to find out some of the major guests that showed up to the reception, including Frederick Douglass. Print enough invitations to address for each of your invited guests. Remember the official White House/Government Seal and appropriate image of the 1860's White House, and other details. Research to find a list of probable guests to this White House event. · Write an essay describing how Frederick Douglass felt when the policemen stopped him at the door of the White House, refusing to let him enter the reception. Describe how Douglass responded to this event. After reading Douglass' own words describing the reception (after he finally got admitted), how do you think the President and Douglass felt when seeing each other? Include this answer within the essay. You could also include your feelings about why this meeting between a sitting President and a black man was so historical. · Read about Washington D.C. in the early 1860's. A good resource to read is from the Mr. Lincoln's White House website, and particularly the Nearby Washington article at http://www.mrlincolnswhitehouse.org/inside.asp?ID=4&subjectID=4 . Think about where the nation's capitol was actually located. Why would Washington D.C. be a possibly "unfriendly" place for a black man to be. Why would it be a "safe" place. Use a Civil War timeline to check out events during the Civil War, especially the first two years. the Civil War.com website has a year-by-year timeline at http://www.civilwar.com/civil-war-timeline-of-events/civil-war-overview.html . describes the year 1863 when African American troops would enter battle. The 54th Massachusetts Infantry Regiment under Col. Robert G. Shaw. Read about Congressional Medal of Honor winners by African Americans at the Buffalo Soldiers site at http://www.buffalosoldier.net/CIVIL WAR AFRO-AMERICAN MEDAL OF HONOR RECIPIENTS.htm. Work within a small group, and make a memorial honor board for all the African-American soldiers that won this award during the Civil War. Provide detailed information and a portrait of each. As you read about recruits, find out the names of Frederick Douglass' own sons that were recruited as Union soldiers. · What were the three "complaints' that Douglass would relate to the President?. · Read the resulting "Proclamation of Retaliation" that the President would issue shortly after the Douglass visit. Why was this so important for the African American Union soldiers? · Do you think the Confederate Army honored and abided by the Proclamation with its' warnings? 3. Using the power of spoken and written language to effect positive change for yourself and society. Making yourself a successful person-- a SELF-MADE PERSON. Read about these ideas from a Wikepedia article at: http://en.wikipedia.org/wiki/Self-Made_Men_(Frederick_Douglass). · Take on the role of being a person born and raised in a very lowly environment such as in the wilderness as the child of a pioneer (like Abe Lincoln), or as the child of slave parents. You are now old enough to make decisions and think about going out on your own way. Make up a name for your role, and describe the person as to how you look, act and think. Be able to apply these details in the narrative story you will write. · Make up a personal plan for success, including: educational needs (how will you achieve these); physical needs such as acquiring food, clothes, and a place to live; personal goals and aspirations to be something special (could involve politics, business, arts, teacher, soldier). Include the high ambitions that you would like to achieve. · Take this general plan and write a narrative story telling of how you achieved your ambitions. Perhaps you could make it a kind of timeline story with early years, middle years (both with struggles) and the final years with more comfort and success. · Title your autobiographical-fiction narrative with an appropriate meaningful title. Return back to 1858 to learn of Abraham Lincoln's early views of "equality." Entering into the Civil War years, conditions for black Union soldiers would get better. Describe how conditions improved, or didn't improve because of the Presidential Proclamation for Retaliation, and orders for equal pay, and other basic rights for blacks in the war. · Antebellum America and the attitudes (North and South) about equality. Read Abraham Lincoln's comments at the Charleston Lincoln-Douglas Debate of 1858. He pretty well expresses the way most Americans felt about equality of whites and blacks. Why do you think Abraham Lincoln would not say that equality would happen, or should happen? · Abraham Lincoln was a strict follower and believer of the Constitution and the Declaration of Independence. How do you think that he could have a conflict with his person hatred of slavery, while supporting the lawful right for Southerners to own and work slaves? Do you think that Senatorial candidate Lincoln (1858) actually would have liked to join in with radical abolitionists? What would have happened if Abraham Lincoln would have joined the ranks of the abolitionists like Frederick Douglass and white counter-parts throughout the North. · Was Abraham Lincoln perhaps more concerned about the spread of slavery into new states than for citizenship and equality for free men? · Did the Emancipation Proclamation end slavery in America? Why didn't President Lincoln require the slave border states (still in the Union) to end slavery? · When Abraham Lincoln would give his last speech a day before he was assassinated by John Wilkes Booth, what did he say in the speech that stated a "new Lincoln viewpoint (from the 1858 Debates' one) and roused Booth to devise a plan to either kidnap or kill the President? · What did Abraham Lincoln think would cause the end of slavery? What was the only legal way to end slavery? · What amendment was approved before Lincoln was assassinated that ended slavery? · What country did Douglass serve as ambassador? "MEN OF COLOR, TO ARMS"